We do not wash our eggs. Eggshells are porous, but they have a natural coating on them called “bloom” (or “cuticle”) that keeps water and oxygen in the egg and bacteria out. Washing eggs removes the bloom and makes it easier for bacteria to permeate the egg. If you would be more comfortable with washing your eggs, I would suggest you wait to wash them until just before you use them to preserve the natural coating. We do refrigerate our eggs but eggs that have not been washed do not need to be refrigerated because of the protective coating. Fresh, unwashed eggs will be fine sitting out on the kitchen counter for up to a month, but the quality of the egg will deteriorate so I recommend refrigerating even unwashed eggs. Refrigeration extends the shelf life of eggs from about three weeks to seven weeks, even longer if they are stored in egg cartons because it minimizes moisture loss through the shells. However, once eggs have been refrigerated, they need to continue to be refrigerated. Cold eggs sitting out in a warm environment may get condensation on their shell which could compromise the bloom and allow bacteria to enter the egg. If you would like to buy eggs that have not been refrigerated, just let us know. Since eggs are one of the most common sources of salmonella infections, commercial egg producers in the America are required to wash their eggs. Salmonella is sometimes present in the intestinal tracts of chickens and can be transmitted to humans when feces contaminate the egg when the shell is broken. Salmonella from eggshells used to be a common problem but stringent procedures for cleaning and inspecting eggs were implemented by the USDA Food Safety and Inspections Services in the 1970s. Today salmonella caused by chicken feces is extremely rare. However, washing the eggs removes the natural coating and actually increases the chance of other bacteria entering the egg so large commercial producers spray the washed eggs with an oil to prevent bacteria and then refrigerate them. Salmonella does not come just from the eggshells of unwashed eggs, however. Most of the salmonella infections from eggs since the 1980s has been from inside the eggs. Salmonella enteritidis may be present in a chicken's ovaries without any discernible symptoms and may infect an egg yolk before the shell even firms up around it. Salmonella enteritidis infection is rare but has been known to occur throughout most of the United States. Generally speaking, only small number of hens might be infected at any given time, and even an infected hen can lay many normal eggs while only occasionally laying a contaminated egg. Eggs with salmonella look and smell perfectly normal which is why cooking all eggs to an internal temperature of at least 160° to kill the bacteria is recommended. Honest confession, sometimes I throw caution to the wind when baking chocolate chip cookies, but officially, I don’t endorse the practice of eating cookie dough because of the raw eggs. Egg production practices vary greatly between Europe and America. In America commercial egg producers are required to wash their eggs. 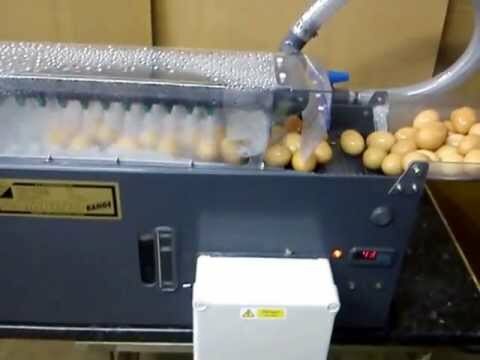 In much of Europe industrial egg washing is actually banned because of the potential of bacteria entering the egg after the bloom is removed. Vaccinating chickens for salmonella is more common in Britain than America. Members of the British Egg Industry Council have to meet certain standards, including compulsory vaccination if they want to display the British Lion Quality mark. Since the major supermarkets buy only Lion Quality eggs, 85-90% of eggs in the UK are now produced to British Lion Quality standards. When American regulators created new egg safety rules in 2010, they declared that there was not enough evidence to conclude that vaccinating hens against salmonella would prevent people from getting sick so the FDA does not require it, even so, many large American commercial egg farmers do. However, the vaccine is sold in lots of five to ten thousand to accommodate the factory farms. This makes it very difficult for the small-flock farmer to obtain the vaccine. A farm with 50 chickens would have to buy a minimum of 5000 doses which must be used within hours of opening. The debate is still open and legislators are being urged to make smaller quantities of the vaccine available to small time chicken farmers. Another difference between Europe and America is the debate about caging. In 2010 the United Egg Producers of America announced that caging hens is better for food safety. In 2012 legislation was passed in Britain prohibiting caging hens following studies done throughout the UK that indicated that egg operations with caged hens have higher incidences of salmonella. This egg was laid minutes before this picture was taken. For the first one, fill a bowl with cold water and place the eggs in the bowl. If they sink to the bottom and lay flat on their side, they’re very fresh. If they stand on one end in the bottom of the bowl they are a few weeks old, but still good to eat. If they float they are not good to eat. The second test involves breaking the egg open. If the yolk sits very high and the egg white is gathered closely around it, the egg is fresh. If the yolk is a bit flat and the white more transparent, it is a bit older but still safe to eat. If the yolk is flat and the egg white very runny, the egg is bad. Throw it out. Have you ever broken open an egg thinking it was hard-boiled…but it wasn’t? The way to test to see if an egg is cooked or raw is to lay it on its side and spin it. Then stop it by touching it with your finger. If the egg begins to slowly move again, it is raw — the yolk and white inside are still moving. If it has been hard-boiled it will remain stationary. Apparently beating egg whites is a fine art...I did not realize that. 1. Begin with fresh eggs. Fresh eggs have thicker whites and the final product will end up with more volume and greater stability than older eggs. In an ideal world, copper bowls work best for beating egg whites because the ions in the copper react chemically with the proteins in the egg white making a more stable, moist foam with fluffy, high peaks. Since most kitchens do not have copper bowls, the same affect can be achieved by adding an acid — cream of tartar, vinegar or lemon juice — to the egg whites just as they being to get frothy. The acid of these ingredients causes a chemical reaction similar to using a copper bowl. It’s not absolutely essential, but it does make the meringue stronger. For each large egg white, use 1/8 teaspoon cream of tartar or ¼ teaspoon freshly squeezed lemon juice or ¼ teaspoon distilled white vinegar. Pasteurized egg whites will not beat into a stiff meringue unless cream of tartar or lemon juice are added at double the amount for regular egg whites. Do not use aluminum bowls, plastic bowls or wooden bowls to beat egg whites. Aluminum reacts with the egg whites and can cause them to turn gray. Wooden and plastic bowls absorb oils. Any oil or fat will diminish the volume. Stainless steel or glass bowls with straight, high sides are the best. Stainless steal has the advantage of being less slippery than glass and the egg white foam will “climb” up the sides better. The bowl must be spotless and dry. To make sure there are no oils or fats some people recommend wiping the bowl and the whisk or beaters with lemon juice or white vinegar, rinsing and then drying carefully before use. Beaters with many tines will incorporate more air more quickly and efficiently. It is important that absolutely none of the egg yolk gets into the white or the egg whites will not foam at all and you will have to start over with new eggs. Separate the eggs into a two small bowls one at a time; put the egg white into your larger bowl before breaking another egg. By separating them one at a time you don’t have to worry that egg yolks from later eggs might contaminate all the whites in the bowl. Cold eggs are easier to separate than eggs at room temperature. The protein in the eggs is more elastic at room temperature and can take in more air, which makes for more volume. If you separate the eggs when they are cold, cover the whites and let them sit out of the refrigerator for thirty minutes or so before beating them. Some people claim that electric mixers generate enough friction to warm the whites. If you are relying on the beater to warm up the eggs, start on a low speed to let friction heat up the whites, then gradually increase to high speed. Sugar molecules interact with the egg white proteins making them more elastic. This help stabilizes the meringue. Generally speaking, the more sugar that has been whipped into the whites, the longer they will hold their volume and stiffness without deflating. Always add the sugar slowly in a steady stream while beating the whites. If the sugar is dumped in all at once it may deflate the area where it lands in the bowl and not dissolve as completely. Once the sugar is added the egg whites become heavier and creamier. It will not hold as high a peak as egg whites without sugar but it hold its shape better. Superfine sugar dissolves more readily than granulated. To insure that the sugar dissolves quickly and completely you can process the sugar in a food processor for one or two minutes before adding it. Sugar that doesn’t dissolve completely may cause the meringue to “weep” or bead on top. Always start slow when beating eggs. If egg whites are beaten too quickly at the beginning, the structure of the foam will not be as strong and the egg whites will not beat as high as they should. While beating on the low setting the “whites” will become more white and have large air bubbles. 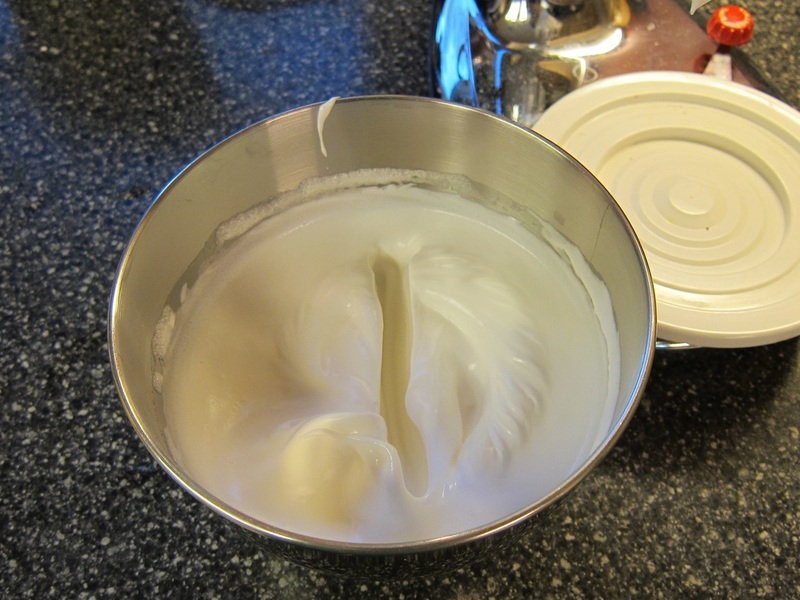 As you continue mixing on low to medium-low speed the egg white foam will increase in volume and become more opaque. The the size of the air bubbles will decrease. If you are adding cream of tartar, this is the time to do so. After adding the cream of tartar, increase the mixer speed to medium. The bubbles in the foam will become smaller and more even in size. When it reaches this stage, increase the mixer speed to medium-high. When the egg whites have increased approximately four times in volume, add the sugar slowly in a steady stream at the side of the bowl. After the sugar has been added, increase the mixer speed to high. Continue to beat on high until the egg white foam becomes glossy. When the peaks of the whites droop when the beater is turned off and lifted the meringue is at the soft peak stage. Firm peak stage is in between a soft and stiff peak stage. When the mixer is stopped and the beater lifted, the egg white's peak should hold briefly and then curl slightly at the end. If the recipe calls for stiff peaks, continue to beat on high until the egg whites are white, fluffy, firm and still very glossy. They should stand up nicely when the beater is lifted. With stiffly beaten egg whites, you can gently cut a narrow groove with stiff walls through the middle with a table knife. 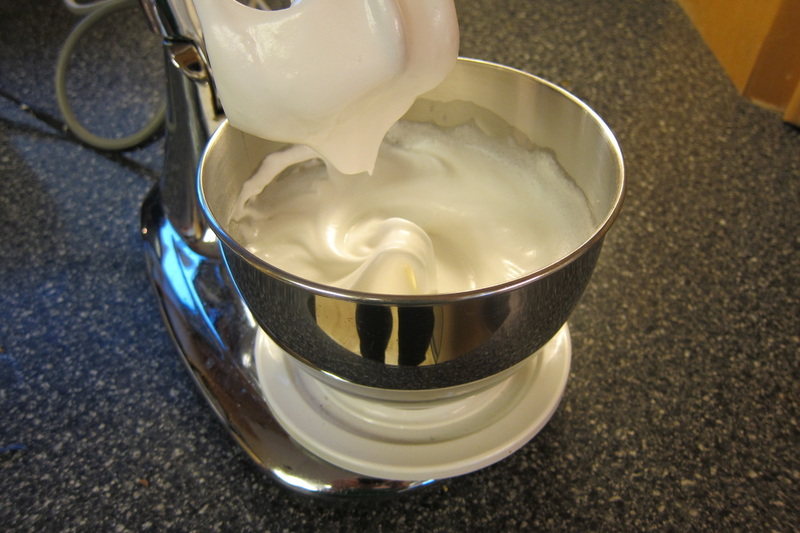 No matter which stage of firmness, add vanilla or any other extract in the final moments of whipping. Do not over beat the egg whites. Egg whites can go from nicely stiff peaks to overbeaten very quickly so you need to watch them carefully. The meringue may separate and become dry and dull with a runny fluid gathering at the bottom. Use your whites in the recipe immediately upon beating them. If they sit for more than 10 minutes, they will lose stability and start to deflate. If you are using the meringue for a lemon pie, never spread meringue over a cold filling. The filling's heat will help cook the center of the meringue and make it much less likely to leak or shrink. Avoid making meringue on humid days. The sugar in the meringue will absorbs moisture from the air and make it impossible to achieve thick, stiff peaks. Humidity may also cause soft meringues to weep or crisp meringues to soften. Be careful not to over bake your meringue—doing so causes the egg whites to shrink and bead up. Always check your pie at the minimum baking time. I got this recipe years ago from Ann Cook, the cook I worked for in the coffee shop at school. (That really was her name). Sprinkle meat into piecrust. Sprinkle cheese over meat. Beat together remaining ingredients and pour on top. Bake at 375˚ for 45-50 minutes. Cool 10 minutes before cutting. If you want you can add 1 cup spinach (thawed and drained) to the quiche. 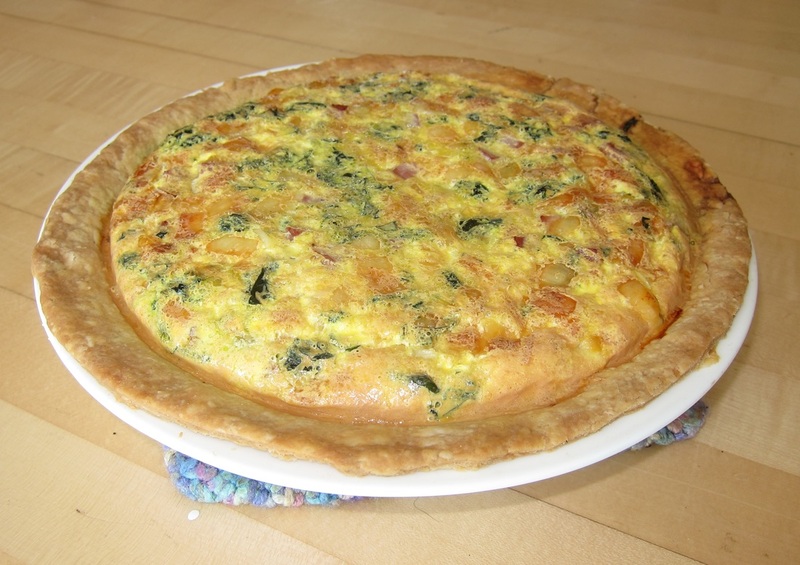 I added 1 cup fresh ﻿lambsquarter﻿, sautéed, to the quiche in the picture. I'd probably add more next time. It cooked up pretty small. Cut off bread crusts and cut into 1 inch cubes. Place half of the bread cubes in a greased 13 x 9 inch pan. Cut cream cheese into 1 inch cubes and place over bread. Top with blueberries and remaining bread. Beat the eggs. Add milk and syrup. Mix well and pour over bread. Cover and chill 8 hour or overnight. Remove from refrigerator 30 minutes before baking. Cover and bake for 30 minutes at 350°. Uncover and bake 25-30 minutes longer or until golden brown and the center is set. Sauce: Combine sugar and cornstarch; add water. Bring to a boil over medium heat; boil for 3 minutes, stirring constantly. Stir in blueberries and reduce heat. Simmer for 8-10 minute or until berries have burst. Stir in butter until melted. Serve with Blueberry French Toast. Place bread in a 15 x 10 inch baking pan in a single layer, cutting to fit, if necessary. Using a pastry brush, lightly brush bread with butter; turn slices over so the buttered side is against the pan. Arrange bacon over bread; sprinkle with 1¾ cups of the cheese; set aside. In a large bowl, beat eggs with the evaporated milk, salt and pepper until blended, slowly pour over bread and cheese. Bake in a preheated oven until nearly firm, about 15 minutes. Arrange reserved tomato slices over the top. Bake until set, about 8 minutes. Sprinkle with remaining cheese. Beat egg whites until foamy. Add cream of tartar. Continue beating until doubled in size. Slowly add the sugar while continuing to beat. Beat until stiff peaks form. 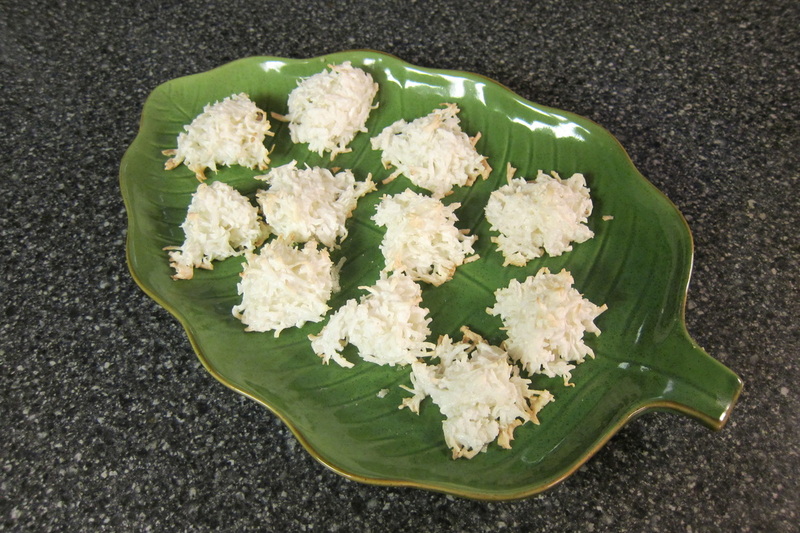 Fold in vanilla and coconut. Bake 15 minutes at 300°. I have to confess. I grew up in Minnesota, but I not only don't have a drop of Swedish blood, I'm also not a Lutheran, so I had never heard of Swedish egg coffee until I was married. We stayed with a good Swedish friend in Montana (a former Minnesotan) who would make a pot every morning, put it in a thermos and drink it through the day. Apparently, this coffee was more popular in generations past, prior to Mr. Coffee, Starbucks on every corner, and Keurig K-Cups. But according HeavyTable.com, a Twin Cities-based magazine about foods in the Upper Midwest, you can still find this special coffee during the Minnesota State Fair at the Salem Lutheran Church's dining hall. I'm not a coffee connoisseur, but when I made coffee this way Joel said the coffee was good -- "really smooth" (whatever "smooth" coffee is). Bring 9 cups of water to a boil. While waiting for the water to boil, mix the coffee grounds and egg together. Some people also crush the shell and add it to the mixture, claiming the calcium carbonate in the shell neutralizes the acid in the coffee. Be sure to wash your egg before you break them if you are going to add the shell. Once water is at a rolling boil, add the egg/coffee mixture (it can boil over very quickly, so be careful). Continue boiling for 3 minutes. The coffee grounds will cook together with the egg into a sort of gross-looking floating mass. Remove the pot from the heat and add the cold water. The cold water is heavier than the hot water and will sink to the bottom taking the clumps of egg and coffee with it. 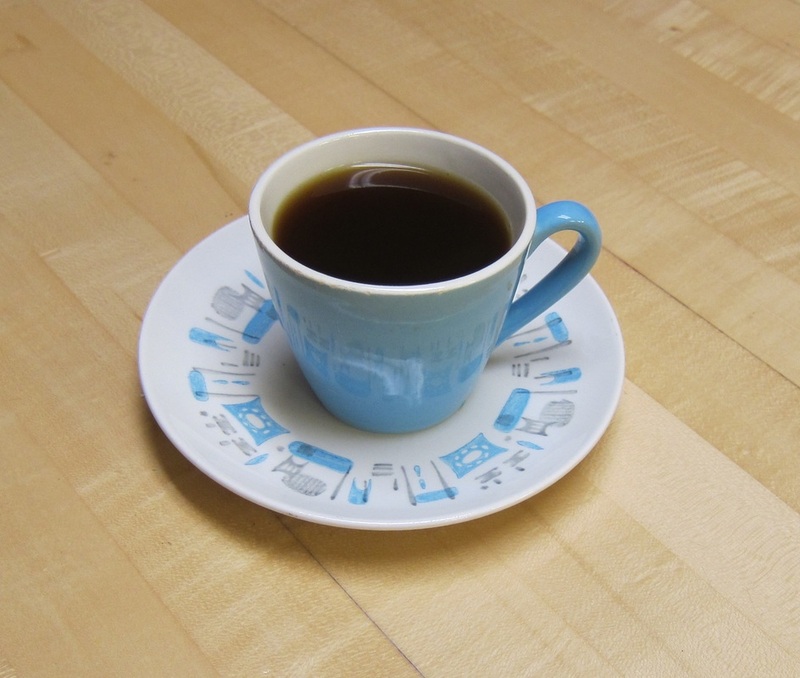 Serve as soon as the coffee has settled. If necessary, strain the coffee as you pour. I didn't need to strain it but wanted to demonstrate what the "sludge" looked like. When Joel saw the picture he remarked, "That's disgusting." When I told him it was the coffee and cooked egg he quickly added, "But it made really good coffee." Sometimes is okay to play with your food. 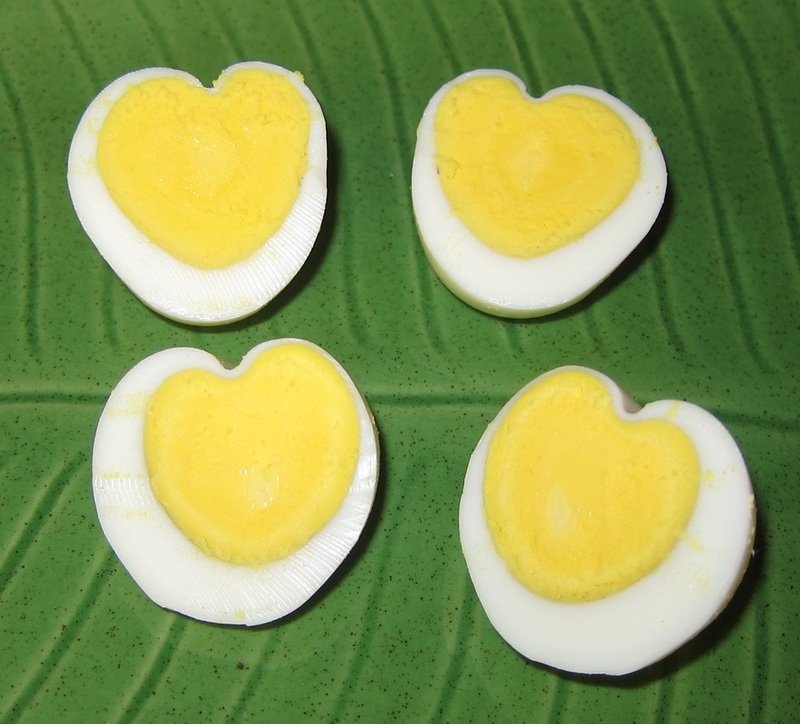 To make a heart shaped hard-boiled egg put the boiled, peeled eggs in a folded piece of food grade cardboard. * Along the top put a chopstick or skewer... something long and thin. Put two rubber bands around each end of the cardboard and place it in the refrigerator for an hour or two. When you remove the rubber bands...eureka! You have a heart-shaped egg for your love. *(I would suggest a milk or cream carton because they will be more firm than the butter carton. My hearts have rather rounded bottoms). There are all kinds of fun things that you can do with egg shells. If you carefully break (or cut) just the end of the eggshell you can dump out the contents for your scrambled eggs, wash the shell and then insert a wick and pour in wax...any color. When it hardens you can either put the egg in an egg cup as it is or peel off the shell and have just the egg-shaped candle. I started my tomatoes and peppers in empty egg shells this spring. I poked a hole in the bottom for drainage, filled them with soil, and planted the seeds. The calcium in the shell is great for the baby peppers and tomatoes. I used a felt-tipped pen to write the particular variety on each shell. When the seeds germinated I crushed the shell a bit and planted the whole thing in a larger pot. One spring I planted marigold seeds in egg shells to use as place favors for Easter dinner. Everyone had a little flower to take home. Another good thing to do with egg shells is to scatter them in the garden. The sharp edges deter slugs and other nasty creatures and the calcium feeds the plants. One year we made mosaics out of the smashed colored egg shells after Easter. Wash the shells and allow them to dry (or bake them at 150 for ten minutes). Put them between layers of newspaper and with a rolling pin, crush them to a very fine powder. Mix together the flour and hot water and add 1 Tbsp of egg shell powder. Mix well and shape as desired. Let the chalk dry for several days. There's just no end to what a creative mind can find to do with the amazing egg! ...even the lowly chicken egg! #1 The Eggshell which is made almost entirely of calcium carbonate (CaCO3) which is the main ingredient in antacids (also seashells, chalk and limestone). Each medium-sized eggshell has about 750-800 mgs of calcium carbonate. 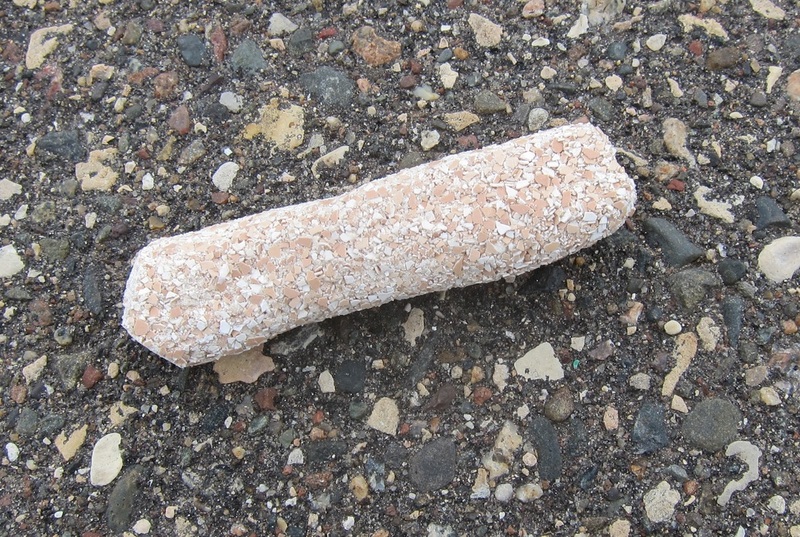 For comparison, an antacid tablet (such as Tums) has 1000 mgs of calcium carbonate. The shell can have as many as 17,000 tiny pores, which allow air and moisture to pass through. The shell also has a thin outermost coating called the bloom or cuticle (#15 on the diagram). The bloom seals the pores and is useful in reducing moisture losses and in preventing bacterial penetration of the eggshell. Most of cuticle is removed when eggs are mechanically washed. The shell makes up 9-12 percent of an egg’s total weight. The shell color is determined by the breed of hen that produced the egg. #2 & #3 The outer and inner shell membranes are just inside the shell surrounding the albumen (egg white). They provide another defense against bacterial invasion and are made partly of keratin, the same fibrous proteins that are found in human skin, hair and nails. The outer membrane sticks to the eggshell while the inner membrane sticks to the albumen. The egg is warm when it is laid. As it cools, the contents contract and the inner shell membrane separates from the outer shell membrane to form an air cell (#14 on the diagram). As the egg ages, moisture and carbon dioxide leave through the pores of the shell and air enters to replace them and the air cell becomes larger. #4 & 13 The chalazae (singular, chalaza) are twisted in opposite directions and serve to keep the yolk centered, the more obvious the chalazae, the fresher the egg. #5 The exterior albumen is a narrow layer of fluid next to the shell membrane. In the picture of the broken egg above the exterior albumen just looks like water on the surface of the board. #6 Middle albumen (the inner, thick egg white) is a dense case of albumen around the yolk. The inner thick albumen stands higher and spreads less in fresh eggs than in older eggs. The white is a protection for the developing chick. 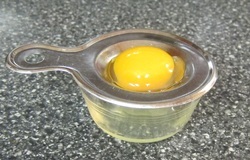 #7 The vitelline membrane is the clear casing that encloses the egg yolk. #8 The nucleus of pander is a plug of whitish yolk whose function is purely nutritional, like the rest of the yolk. #9 The germinal disk is a small, circular, white spot (about .1 inch across) on the surface of the yolk. This is where the sperm enters the egg and the embryo develops. It will gradually sends blood vessels into the yolk to absorb nutrition for the developing embryo. #10 The yellow yolk is a major source of vitamins (A & D), minerals (phosphorus, calcium, thiamine, and riboflavin), protein, fat and cholesterol. The yolk contains less water and more protein than the white. Yolk color ranges from just a hint of yellow to a magnificent deep orange, according to the feed and breed of the hen. #11 The “white yolk” (also known as, the latebra) is an area of white in the center of the yolk. The specific function of this is uncertain but it may act as the structure around which the additional layers of the yolk are formed. 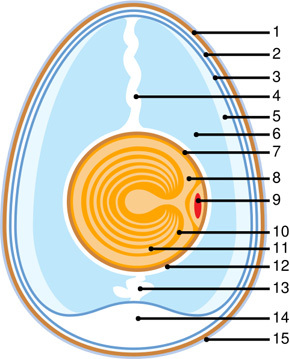 #12 Internal albumen is a dense, fibrous capsule of albumen around the yolk which terminates on each end in the chalazae twisted in opposite directions and to keep the yolk centered. For some reason, I associate eggnog and custard with recovering from a stomach illness when I was a kid. At that time the eggs were raw, we would just beat together an egg and milk with a little vanilla and sugar. The first time I had eggnog from the store for Christmas I was sort of freaked out...it was nothing like what knew to be eggnog. I have come to really like it but can't afford either the price or the calories in the amount I'd like to have it. So I played around and came up with a recipe that I like. You can adjust the milk from skim (if you are really watching it) to whole milk with added cream and the amount of sugar to suit your taste. Heat the milk in a large pan until hot but not scalding. While the milk is heating, mix the eggs, salt and sugar together in a large bowl. It's hard to get powdered sugar to dissolve in the eggs so I generally save about ¼ cup of milk to mix with the sugar first. After the sugar has dissolved in the milk, I add the eggs one at a time. Slowly add the hot milk to the egg mixture. Return to the pan and cook over medium-low heat, stirring constantly until the temperature reaches 160° on a candy thermometer (it will take about 5 minutes). Remove from heat and add the extracts. Chill in the refrigerator. After it’s chilled I like to blend it in a blender until smooth and frothy. For a richer eggnog, fold in one cup of whipped cream. Pour into glasses and sprinkle nutmeg on top.